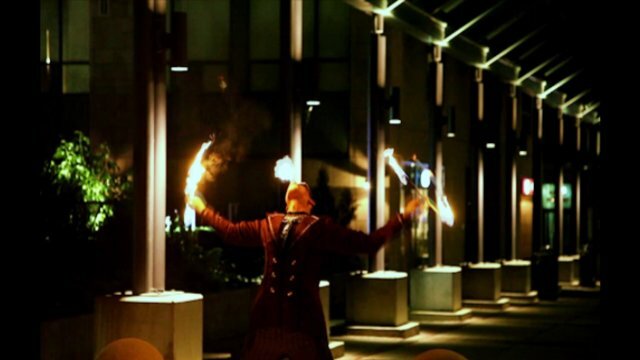 Fire eating is an ancient and dazzling art. Originally used as a part of Hindu spiritual performances where fire was put into the mouth and "swallowed" which allowed practitioners to speak with the diety Kali Maa. In the 1800's fire eating was adopted into side show and circus performances where it became popularized. The act of putting out fires with one's face is still considered shocking to audiences today and fire eating is among the most dangerous of all the circus arts. Fire eating is Terrence's specialty. He has trained countless hours pushing the skills and the art in a new direction. The precision and control exercised during a Drake Show performance is unmatched. The size of the flames used in Terrence's fire eating performance are some of the biggest, hottest and longest burning in the world. In addition the style of Terrence Drake's performance acknowledges fire eating's more intimate beginnings creating a thrilling stunt show with significance.